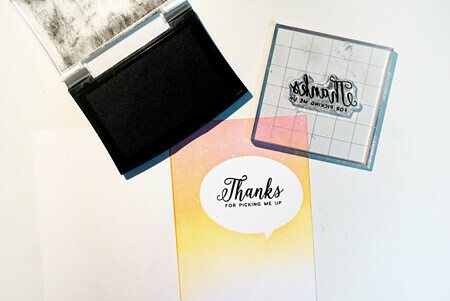 Hello and welcome to our last Stamp Highlight of the March release!! 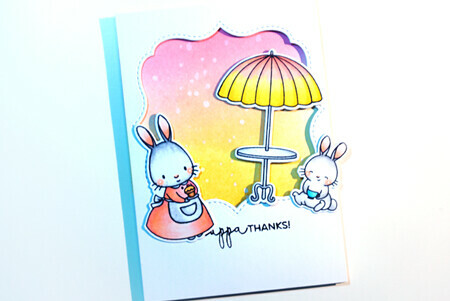 We will be taking a look at the newest alphabet stamp Lots of Letters. I just love how tiny these letters are. It’s perfect for creating your own sentiments. And you can stamp out long quotes if you want to! I wanted to create a background with falling letters in the same shades as my dragon. 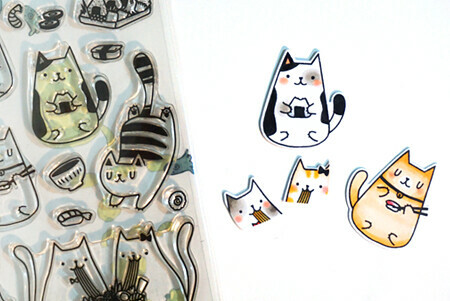 Can you tell I can’t stop colouring these things? 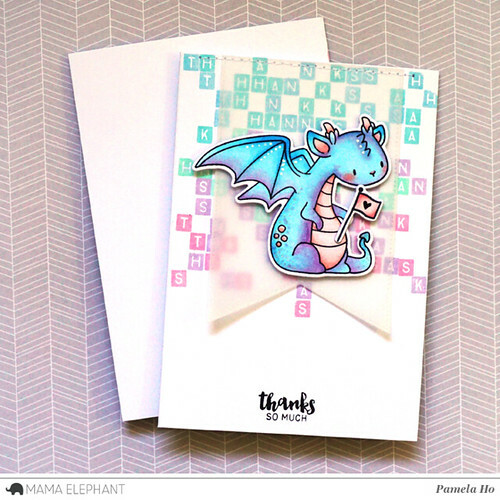 I stamped out “thanks” in the background, using blue, purple and pink and stitched a banner (Dotted Details creative cuts) on top to soften the area around the dragon. 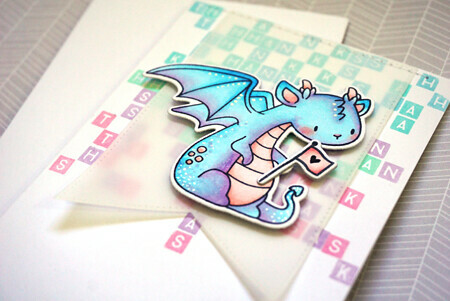 I stamped out the dragon from Me and My Dragons and coloured in copics (B00, B01, B02, B05, BV00, BV11, BV13). 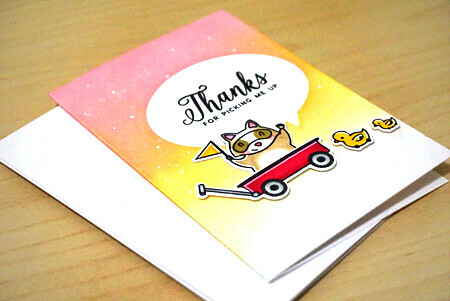 The card is then finished off with a simple sentiment from Mini Messages. Good morning everyone! 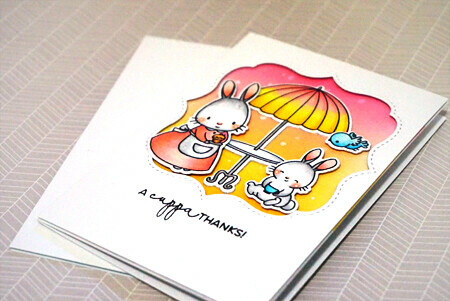 I’m super sad that I missed out on creating some bunny cards for you last month, but I’m back with this super adorable stamp set called Tea with Friends that’s part of Mama Elephant‘s February release. 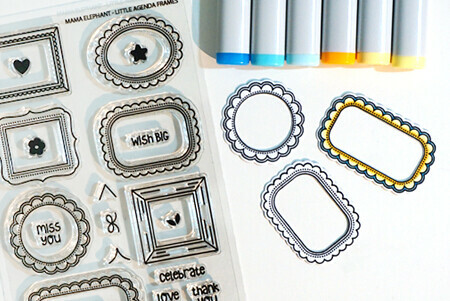 I first stamped out all the elements I want to put on my card. 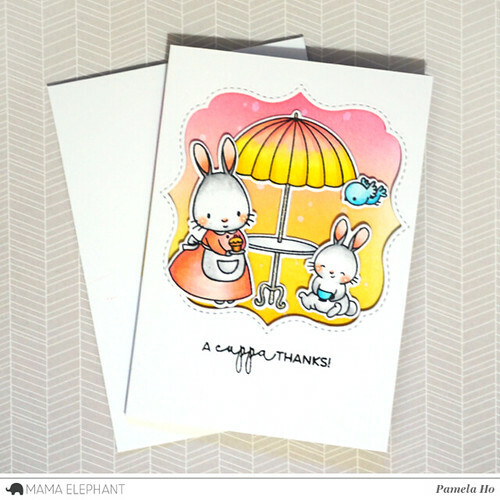 I used the Mama bunny from Tea with Friends and the little bunny is from Picnic with Friends. Have I ever told you I love the curly bracket die from Framed Tags – Union Square? 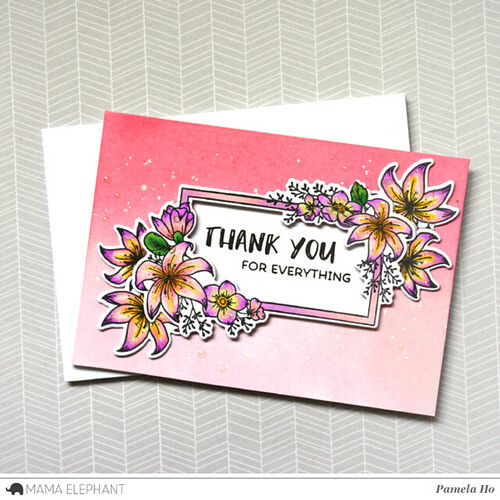 If I could, I’d use it on every card! 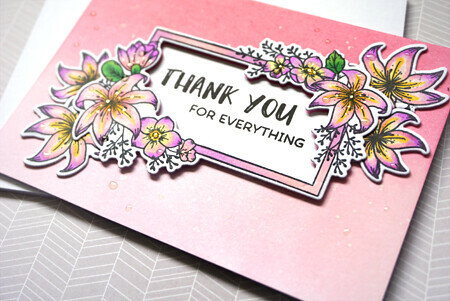 I cut out the middle with the bracket die and blended a pink/orange/yellow blend onto the card base. After I finish blending the background, it’s time to put all the pieces together. 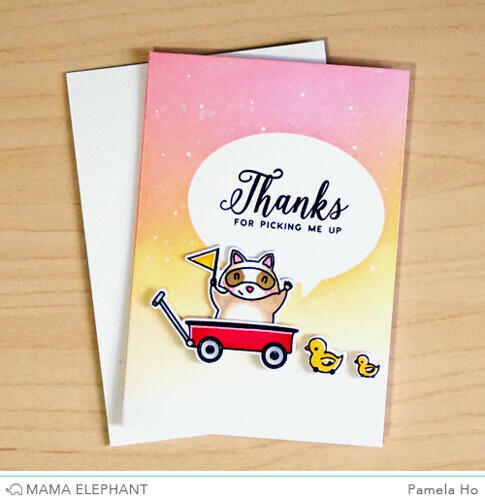 And here’s the finished card! 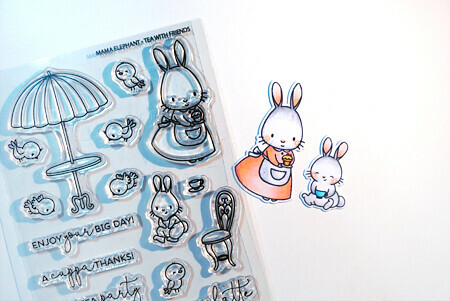 Just in time for the Peter Rabbit movie too! 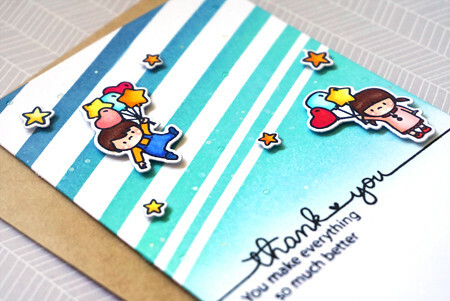 Here’s a close up of the card, where you can see the white and water splatters against the blended background. Hello, hello! Welcome to a very special Summer Release Stampede! 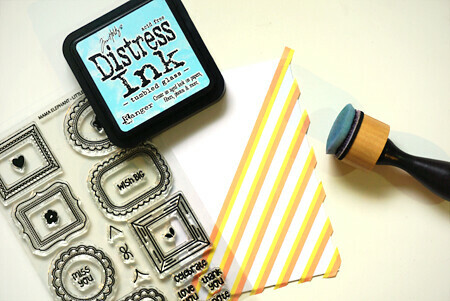 We are thrilled to bring you this splashin’ release of 6 new stamp sets and 7 Creative Cuts dies! 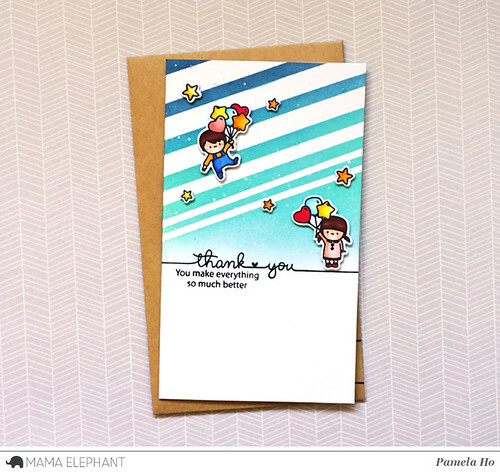 Today, I’m using the super adorable Agenda Boy and Agenda Girl in my card, paired up with Sunday Sentiments. I just love how these little guys have similar themes yet different poses, like this little boy and girl both holding onto balloons! I decided to do a little bit of stripes masking and blending for the sky so it’s not a solid gradient. I added in some little stars from Pix’s Happy Holidays to go along with the cute star balloon that they’re holding onto. Since this is a special release, we’ve got to bring in some super special people to join our Design Team, right? I can’t think of a more stellar line-up than this right here! Hello! 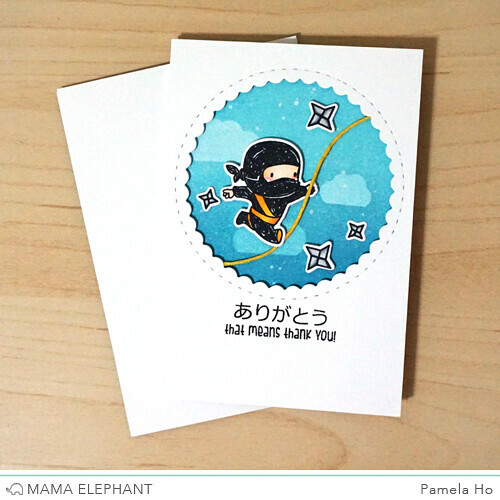 Today, I’m on the Mama Elephant blog today with a little card featuring Tiny Ninjas. This little ninja was just calling out to be paired with a piece of string for rope, so I made it into a fun swinging ninja! I first masked off an area to blend my background in. 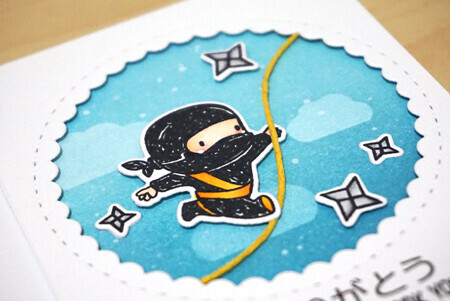 I wanted the ninja to be swinging around against the sky so the ninja would pop out against the blue background. 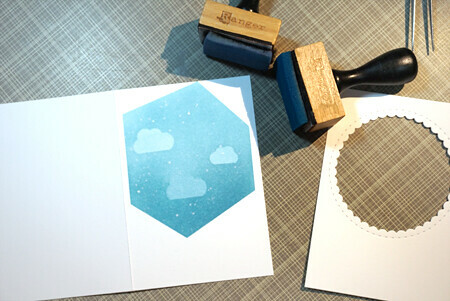 I masked off some clouds using the die cut from Sunday Stroll. 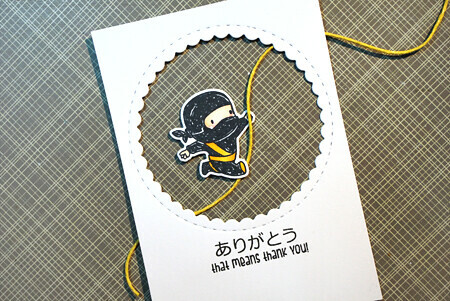 I finished off the card with a simple “Thank You” sentiment from the same Tiny Ninjas stamp set. 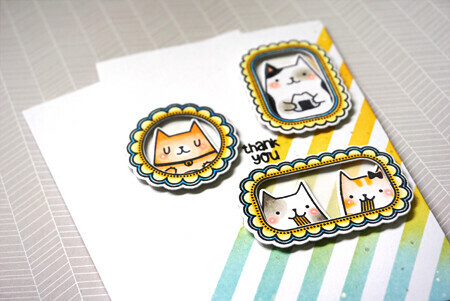 If you look closely, you’ll see some water and white paint splatters against the background! Good morning everyone! 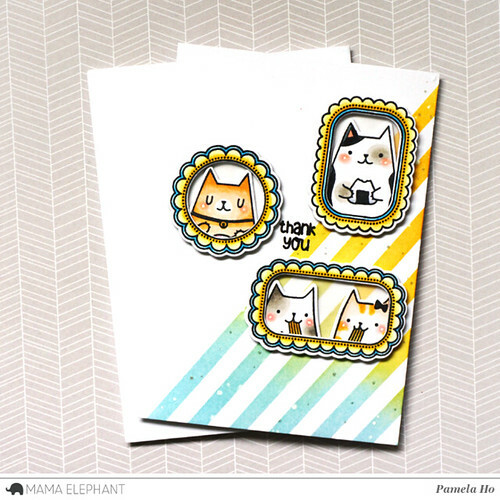 I’m taking over Mama Elephant‘s blog for today with a project using Rowdy Raccoons stamp set and its coordinating dies. 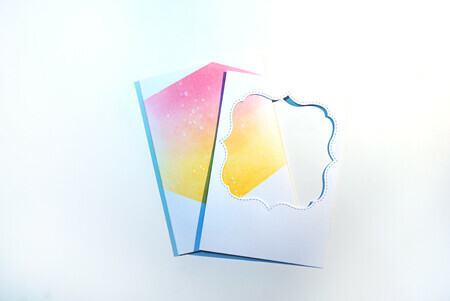 I created a very simple card base using the Index Card creative cuts to mask off a bubble for my sentiment. 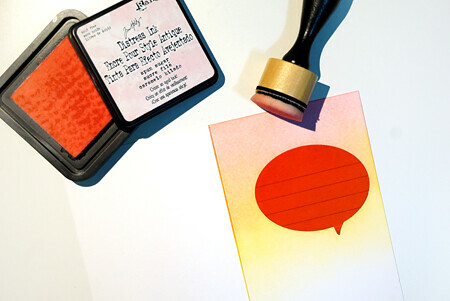 I blended pink and yellow together and flicked some water onto the blending to create lighter splotches. I stamped the sentiment from Tandem Extras in the bubble. 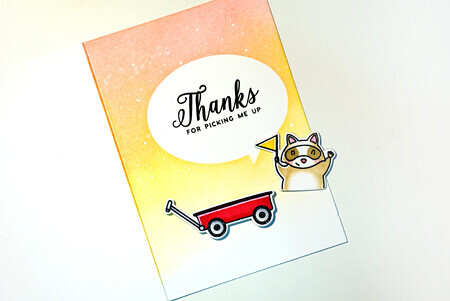 I thought the “pick me up” was perfect for the Mr. Raccoon in the little wagon!